Lewis talks about being controlled by others' opinions today in A Year with C.S. Lewis. He says that one way the enemy tries to control us is by making us lose our actual interests and replace them with what others think. And that puts us in a sort of mental prison. The quote above is the release from that prison. 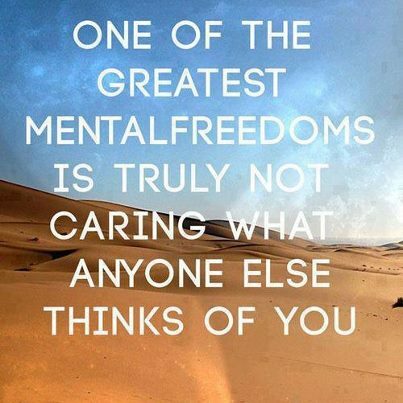 Not being controlled by other people's opinions is one of our greatest mental freedoms. We can choose this freedom anytime we want. 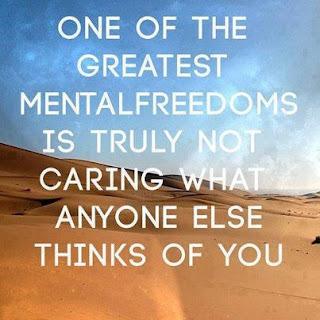 But so many of us live in this prison all of our lives. It can make us miserable. If you suspect that you might be living in a prison like this, or one that's similar, ask God to show you how to get out. I promise you that He will answer that prayer. He wants you to be free far more than you do. He knows the greatness that He created you for. And just like a parent hates to see their child waste their talents and their lives, God doesn't like to see us, the children He made, waste away in a prison of our own making. He will help us find the way out. God, thank You for setting us free. And help us to remember that it is for freedom that we have been set free, and to walk in that freedom. Amen, gotta use our talents and not follow other people's opinion.